Betaine hydrochloride with protease is designed to aid digestion by promoting the production of stomach acid and by helping to begin the process of protein digestion. Additionally, it helps to provide methyl groups that are vital to several physiological processes. Purchase this product now and earn 1,769 Reward Points! Betaine hydrochloride (HCl) is used as a supplemental source of hydrochloric acid to aid digestion, to treat low potassium levels, and to protect the liver. 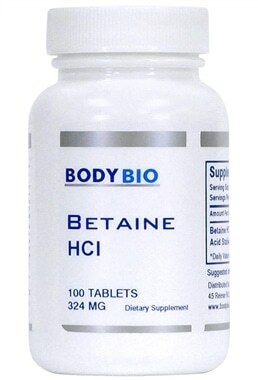 Betaine HCl is not to be confused with betaine anhydrous. As trimethylglycine (TMG), betaine anhydrous is used almost exclusively to treat high homocysteine levels by donating a methyl group to convert homocysteine to methionine, while as the chloride salt of TMG, betaine HCl is used to help persons with insufficient stomach acid production. Both forms of betaine are active methyl donors, having the same basic chemical formula. 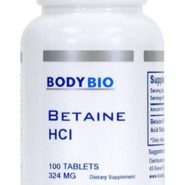 Betaine HCL is used to support healthy stomach acidity, gastric function, and protein digestion.